Less noise, less pollution, more fun! 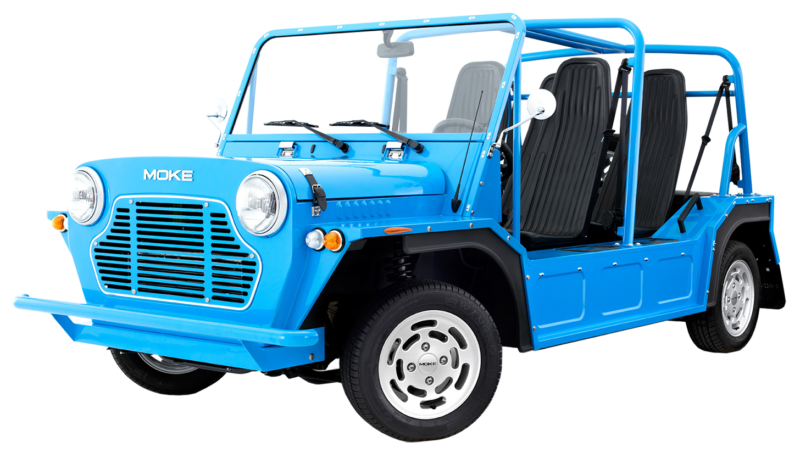 From British classic to Caribbean icon, the Moke electric vehicle has become a symbol for fun in the sun. A Moke rental from Wheel Fun Rentals is the perfect way to enjoy all that Santa Barbara has to offer. Enjoy an open-air drive through beautiful Santa Barbara, one of the West Coast’s most attractive beachfront cities, in a Moke Electric Vehicle. Our Mokes are Low Speed Vehicles (LSVs) that feature a top speed of 25 mph and a maximum distance of 40 miles between charges. Mokes are street legal and the perfect way to explore Santa Barbara with the sun warming your skin and the wind blowing in your hair, and with no emissions, they are environmentally friendly and efficient. Less noise, less pollution, more fun! Call (805) 966-2282 to reserve your Moke Electric Vehicle today! Moke electric vehicles may only be driven on city streets with a posted speed limit of 35 MPH or less. They are not allowed on sidewalks, the bike paths, the beach or highway. A maximum of 4 people may ride in a Moke electric vehicle. Seat belts are required. Drivers must be 21 years of age and possess a valid driver’s license. No children under 13 years of age in the front passenger seat.